The smell of violets reminds me of being a child and being given Parma Violet sweets. It also reminds me of Spring and the hope that a new season always brings with it. I also love their colour, in fact they’re one of my favourite flowers and I find their sweet smell totally enchanting. 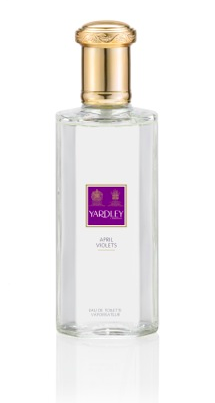 I recently came across April Violets from Yardley and fell in love with the scent straight away: It contains fresh, green violets leaves, citrus and geranium top notes, with a heart of parma violets, iris, jasmine, ylang and tuberose and warm vanilla base notes. It’s sweet and subtle enough to wear all day long and the addition of tuberose gives the cologne a real edge. I have the soap in my bathroom (it makes the whole bathroom smell beautiful!) and the Eau de Toilette on my dressing table. The soap comes in a pretty tin, making it an ideal gift or stocking filler. The soap retails at £4.99 and the EDT 150ml is priced at £14.49. For more information go to www.yardleylondon.co.uk. This entry was posted in Scents and tagged beautiful, eau de toilettel, EDT, floral, freshness, violets, Yardley. Bookmark the permalink.